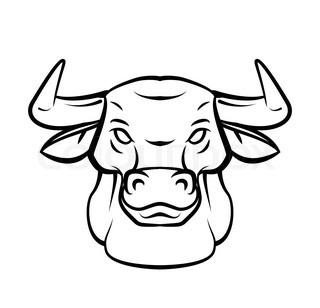 This is the easy video tutorial in which you will learn about how to draw a bull head step by step for beginners. You can draw this on paper using pencil. We are going to show you to sketch a bull head in an easy and step by step method of drawing prepared exclusively for beginners and kids. In this video tutorial, we will draw little bit lengthy illustration enabling you to learn slowly and we encourage and prompt you not to miss any single technique in this video tutorial. Bulls as seen in Spanish fights seem ferocious and dangerous for humans as they do not hesitate to torn anything apart into pieces and yes, humans are on their hit list. There are many species of bulls. Generally, bulls are adult males of Bos Taurus species. They are way much stronger than their counterparts i.e. cows and have a huge importance in many cultures regarding cattle farming and reproduction process. In Australia, they call him micky. As said above, they have thick bones, a muscular neck, large feet, and a bony head. They weigh more than cows due to their tallness and strong characteristics. It is a great misconception that bulls angers by seeing red color, contrary to the fact that like other mammals, bull is a red-green color blind and could not differentiate between red and green colors. It is the stance of a matador’s cape that revokes the bull to react. Another use of raising a bull is to get a huge lot of meat. It is a tradition in many regions to pierce a ring into bull’s nose to keep them controlled in a fight or for general purposes. Watch the video below and draw this video staying in your comfort zone. Share this amazing video with your friends on Facebook and show it to your teacher when it becomes perfect to be shown to get an extra grade. Watch other tutorials below or search them from homepage.